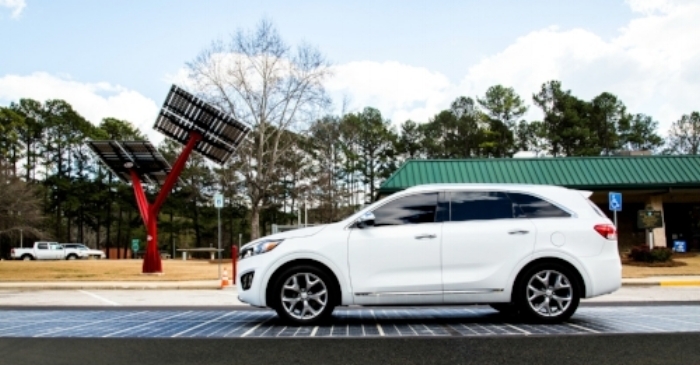 The Ray has installed solar-powered vehicle charging centers, tire safety check stations, and solar-paved highways. They are working hard to set a new standard for roadways worldwide. The Ray is founded on the principal of corporate social responsibility. Ray C. Anderson, The Ray’s namesake, pioneered the idea of sustainability in business. In 1997 he made the commitment to build tomorrow’s sustainable company, “with zero scrap going to the landfill and zero emissions into the ecosystem.” It’s this fundamental principal that leads The Ray’s vision to be a net zero highway. They recognize that highways are among the most environmentally damaging infrastructures in the world, which is why they have gone above and beyond to ensure they are continuously improving the safety, beauty, and ecology of their 18 mile stretch of I-85. Their dedication to sustainable roadways is evident through their involvement in the Georgia Sponsor A Highway® program. They are working to maintain clean roadways by financially sponsoring litter removal and highway beatification along ten highway miles located in LaGrange & Westpoint, GA along the 085 both northbound and southbound. Drive over the world's only tire pressure and tread depth monitor and get instant results that can keep your car safe and fuel efficient. The Georgia Sponsor A Highway® program is an environmentally responsible program. The financial sponsorship of 1 mile stretch of highways enables AHMC crew to carry out litter removal on a monthly basis.